Livecontacts Localizer - GSM Tracker software to change you GSM into a GPS device! Livecontacts is the first GPS enabled service that brings you an array of features you can not find anywhere else. GPS-enabled maps, directions, and points of interest. Let your friends and family know where you are. Livecontacts allows you to pinpoint your location and find out who's nearby. You can also share your location with trusted people, view your location history on an interactive map, manage your address book, or have information on your contact's whereabouts in maps available. Monitor your contacts presence information and connect with people on the go using chat, SMS, IM, email or phone. Using the associated web site, you can allow other users to view your location on the Internet. 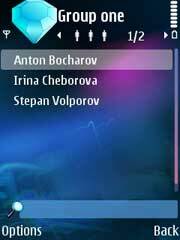 Livecontacts is a downloadable application for your GPS-enabled PDA or Smartphone. Livecontacts is targeted at individuals and closed groups with active lifestyles who have a need for greater location awareness and communication between trusted family, friends and colleagues.